Aqua Sanrise Plus 90 is a professional 72 LED aquarium light which includes WiFi smart control, Multi Unit control, Intelligent temperature control, DIY lens and LED replacement capability. DIY with modular 5w and 3w LED clusters (Cree XTE & XPE LED's), lenses & fans. Ultra slim (H 23.5mm) aluminium housing waterproof to IP54. Manual touch control and 6 channel full WiFi control of sunrise to sunset timer program, 1 x preset program for SPS & LPS aquarium, lightning and clouds, colour and intensity via IOS & Android devices. The integrated WiFi controller means you don't require an internet connection to operated the light via your IOS or Android device. Control multiple lights simultaneously with the new Multi Unit control feature. This function works through your home WiFi router. 24 time points are programmable. Supplied with 3 in 1, 90 degree optical lenses for deeper light penetration. High 97% light transmission through the lens. Optional 120 degree lenses available for wider/shallower light spread. 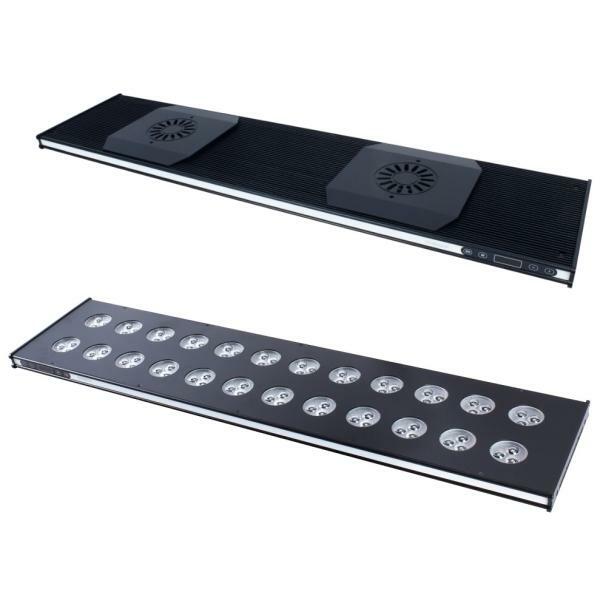 Ultra quiet Smart fans and smart temperature control system for optimum LED cooling. Adjustable tank mount and S/Steel hanging kit included. TMC runs a Sanrise Aqua Plus LED instore! Come on in and have a chat to one of our friendly staff for more info.